This was a great weekend. I got into Long Beach on Saturday around noon. Ken Saxton, the resident barefoot runner of Southern California picked me up at the airport. We proceeded to the expo to pick up our packets. At the expo, we ran into Todd Byers and Bill and his wife. We also picked up Cathy, Ken’s wife. Next stop was Papa John’s so I could get my large pepperoni and anchovy pizza to begin my carbo-loading. Ken took me to my hotel (across the street from where he lives) where I settled in for a while. Later, I walked over to Ken and Cathy’s where we loaded Herman into the jeep for a trip to Dog Beach. Herman is part Golden Retreiver, part Pyrenees which makes him a rather large dog. Herman was docile until we got him to the beach, and then he turned into this very playful puppy, running and meeting all the other dogs on the beach. We had a great time running with Herman, spending about an hour getting in a nice beach run. We did not want to overdo it the day before the marathon so we headed back to Ken’s for a bit. I excused myself early and went back to the hotel to turn in early. Got up about 5 a.m., checked out of the hotel, and walked over to Ken’s. We left his place and headed to the race. We had plenty of time to hang out and talk to several folks that Ken knows. It was nearing race time so we went and lined up. We were way in the back so it took over 5 minutes to cross the Start line. We were finally off and it was dodging and weaving for at least a mile. First mile was a 9:49 by my watch. That’s okay by me, I thought. I have no expectations of anything grand today since I have been dealing with sciatica in my left-lower back this week and a tight left-calf. I know that if I try to turn on the gas, I will flood the engine (metaphorically speaking!). The course had quite a few twists and turns as we continued out to the Pike and around the aquarium. Road surfaces were pretty good and the conversation with Ken and Bill was enjoyable. We got to dialogue with several others along the way regarding our small barefoot brigade. Somewhere around mile 3, I think, we lost Bill. We continued on back up around the Convention Center, heading south on the bike trail along the beach. It was a beautiful morning with some overcast skies and a gentle breeze blowing in from the ocean. I could tell it was going to warm up quickly, however, if the clouds cleared out. At about mile 8 or 9, Ken was feeling good and decided to push the pace a little quicker and I wished him well as he sped off. I was content with my 9:30 minute pace. (This slower pace made me stop and make 3 bathroom stops during the race – that was a new one!) The asphalt that we ran on in subsequent miles after leaving the bike path was a bit rougher than what I was used to, but it was nothing I felt like I couldn’t handle. We entered some neighborhoods of Long Beach and eventually did a turn-around in Naples. We continued on, up around the refineries and then started back at about mile 21 toward Long Beach proper. All this time, I had been hearing, “Hey, there’s another barefoot runner!” so I knew Ken was up there somewhere. I was hoping that he had burned up the course and would make his ’05 BQ. The last couple of miles, my feet needed a break so I ran on the sidewalk and on some grassy spots to give my feet a break. It especially felt good where they had just finished watering the grass. Very cushy and refreshing! As I head down the hill to the finish line, I hear Rudy from the announcer’s booth (I had met him at the expo the day before) saying, “Can you believe it? Here comes Rick Roeber from Lee’s Summit Missouri. He ran the entire course barefoot!” I got a huge applause which was really nice. Crossed the finish line at 4:13:42. As soon as I got done, I went looking for Ken. I finally saw him a couple of minutes later coming through the finishers’ area. I couldn’t believe it. Where did I pass him? Must have been when I was running on the sidewalk and grass. We relaxed for a bit, and then Ken took me to the airport. My flight got into KC about 11 p.m. It was one of those weekends that is kind of a blur, but it was well worth it. 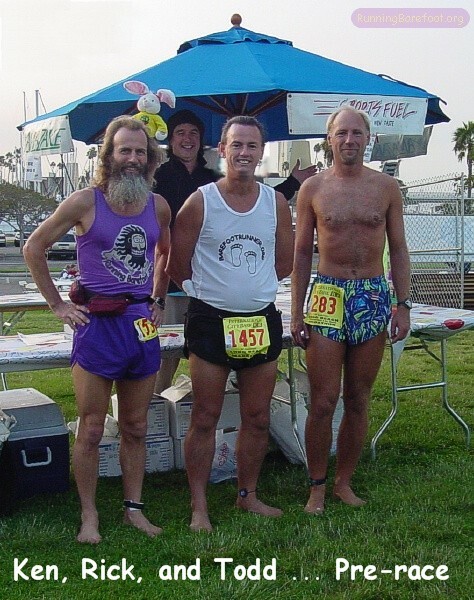 Got to spend some time with some great barefooters, completed my 4th barefoot marathon and my 22nd overall. It was a a very satisfying weekend! 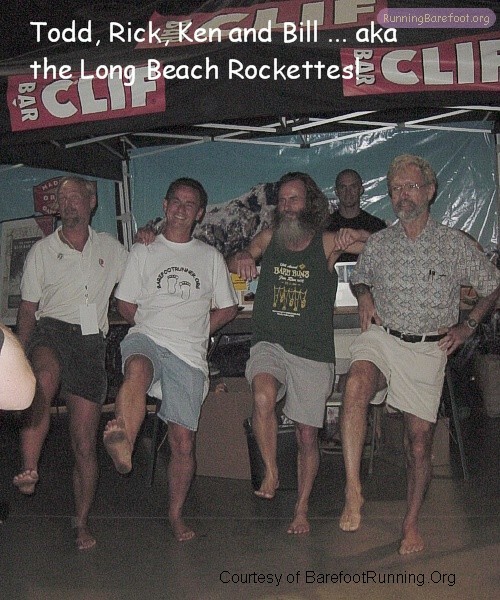 Click Here For Barefoot Ken Bob's Report!